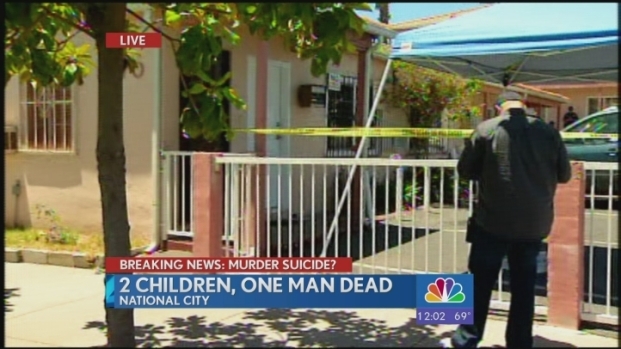 One adult and two children were found dead in National City Tuesday, according to police. At 10 a.m. police received a call about a welfare check at The Paradise Motel on 1470 National City Blvd. Officers arrived and made several attempts to contact the occupants, but no one answered. Police then entered the room and found the bodies of two children on top of a bed with one male adult body nearby. A girl and 16-year-old boy had fatal gunshot wounds, according to Sgt. Julian Villagomez. The male was found near the children with a self-inflicted gunshot wound. He was the father of the two children, according to police. On Wednesday, a report by the medical examiner identified the 16-year-old boy as Marco Antonio Jaimes and the girl as 11-year-old Maria Angelica Jaimes. One adult and two children were found dead in National City in what police believe is a murder suicide. Brandi Powell spoke to authorities on the scene just after they responded for more information. The adult male – the kids’ father – was identified by the medical examiner as 38-year-old National City resident Maurillo Jaimes. An employee at The Paradise Motel said a woman claiming to be the children's mother had knocked on the door of the room Tuesday where the bodies were found. The woman told the employee that the father had called her saying he was going to commit suicide. The woman then called police when no one answered, according to the hotel employee. After police told the woman what they found inside the motel room, she started crying. More than a dozen family members went to the National City Police station after the incident and were incredibly upset, according to police. One of the family members was so upset, an ambulance was called to the station. Neighbors of the Jaimes family said 11-year-old Maria went to Pacific Beach Middle School and 16-year-old Marco attended Mission Bay High School. They also said the parents were in the process of separating. Officials are investigating the incident as a murder-suicide.